This Sesame Street cake was a big challenge for me it being the second one I’ve ever done. I made six pound cakes using mixes and pudding mixes (easy recipe found online) cutting the top layer of each tier diagonally and repositioning it turned around the other way to add height at one end and prepared for stacking using wooden dowel rods and cake circles as separators. I made three batches of marshmallow fondant but I should have used four. I covered each tier individually and then stacked them. Before I added the fondant I covered the cakes with crumb coat and then a thin layer of buttercream icing but I think a jam would have been neater to work with. I then made all my cutouts from fondant and attached them with a touch of leftover buttercream but water or egg whites work just as well and hide imperfections. I wanted to do a rainbow bow on top but ran out of time to let the fondant dry (this should have been planned ahead of time). I used sucker sticks wrapped in fondant for the decorations. My daughter loves Sesame street and so I decided to make an Elmo cake. A couple of weeks before her second birthday she fell in love with Zoe so I couldn’t help but make a Zoe too. For Elmo I used the Wilton Elmo pan. First I frosted the eyes and nose. Then the eye pupils and mouth smoothing them with my finger dipped in milk. Black frosting tastes best if you start with chocolate and add black food coloring. I used store bought chocolate frosting for the black and made the traditional Wilton butter cream frosting for all the other colors and used Wilton food color pastes. For the red fur I used a large star tip. Instead of making stars where you release pressure on the frosting bag and then pull up I kept pressure and pulled the frosting up and then released to make Elmo look furry. This does take more frosting so I made whole batch of red and used the Wilton No Taste Red food color. I made the frosting the day before and it looked dark pink. By the next day was really red. I probably could have used much less coloring had I known that it would keep getting darker. For Zoe I used the Wilton Elmo cake pan. Before frosting I trimmed the nose down to a smaller size. First I frosted the eyes and eyelids. I cut mango flavored fruit leather to make eye lashes. (Fruit roll ups are too limp look for the thick fruit leather.) Then I frosted the tongue, mouth and nose smoothing everything with a finger dipped in milk. Eyeballs are a dollop of black frosting. To make Zoe look furry I used the Wilton hair/grass tip. The barrettes are plastic barrettes I borrowed from my daughter’s collection. To complete the Sesame Street theme I made suckers with a mold I found on eBay that had Elmo, Zoe, Bert, Ernie, Big Bird and Cookie Monster. I also made letter of the day sugar cookies with the first letter of all of the guests’ first names. The number of the day was of course two. To decorate them I used up the extra frosting that I had from making the cakes. This party theme was a lot of fun! These Sesame Street cakes were for my twin boys’ first birthday. My original idea was to get a Wilton Elmo cake pan but after looking at the design in the store I thought it would be pretty easy to make an Elmo face out of a round cake. I bought a beginner’s cake decorating kit (this was my first time doing a "decorated" cake) found an Elmo face picture that I liked online and printed it out to the size I wanted. While I was at it I thought it would be fun to them each their own mini cake (bought Wilton 4 inch cake pans) and I just used the same idea for Cookie Monster. I made a practice mini cake just to see how long it might take. I froze it and then cut around the picture to get the right shape. I think having it frozen made it really easy (an experienced cake-maker gave me that tip). For the party I ended up using two boxed cake mixes and made each cake half chocolate and half white and used the leftover batter for cupcakes. It made the Elmo cake, the mini Cookie Monster cakes and lots of cupcakes. I made a batch and a half of the butter cream frosting (which ended up being more than enough) and found it worked a lot better out of the pastry bag when it was refrigerated. The cakes were a big hit. The boys ended up eating every last crumb! 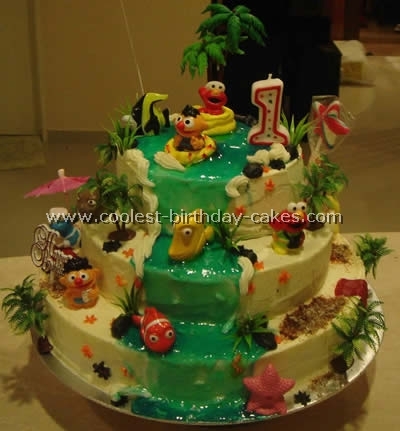 So now I’m really looking forward to attempting some Finding Nemo cakes for this year’s party – using this site as a wonderful resource for ideas. 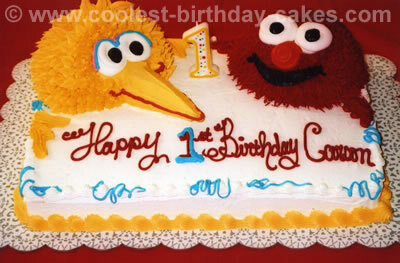 Zack loves Sesame Street, so we searched this site for Sesame Street birthday cakes. We just baked a regular 11×15" cake for this one. We covered the entire cake with white icing first. I drew an outline of Elmo and Cookie Monster’s faces on paper plates and we cut them out. For Elmo my husband held the paper plate lightly against the cake and I used red icing spray. His nose is an orange plastic Easter egg. For Cookie Monster I used the same paper plate method except this time we used blue sprinkles. Their mouths were put on with store-bought black icing that comes in a can with decorating tips on it. I think we used the flat tip. Their eyes are powdered donuts (that’s the part Zack liked) with upside down Hershey kisses. I tried to put the kisses off center for Cookie Monster to show his wiggly eyes. For a little extra we added the goldfish (to be Elmo’s goldfish Dorothy) and animal cracker crumbs to Cookie monster. The hardest part was cleaning up where the spray went outside the stencil. We were very excited to see how the cake turned out and Zack loved it! 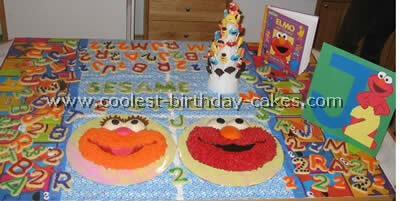 I used a Wilton small 3D bear cake pan for the characters of Sesame Street. After baking and cooling I cut off the ears and used fondant for the eyes. I also used fondant for the hands on Elmo. The eyes and hands are held in place with tooth picks. I also used fondant for the base of the cake and used star fondant cutters for the decorations on top of the cake. The stars are decorated with edible sprinkles. The Sesame Street cake and cupcakes were made for my son Danny on his 2nd birthday. 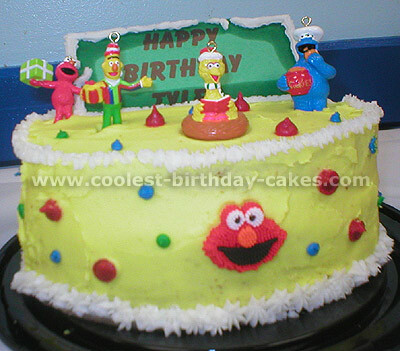 The main cake Elmo was made using the Wilton cake pan and their recommended icing colors. A spatula was used to make Elmo’s fur look fluffy. 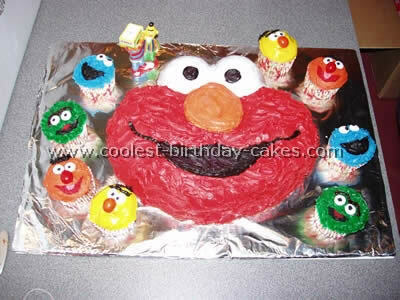 Corn syrup was used to smooth and shine the frosting on Elmo’s eyes and nose. The cupcakes were my own creation. 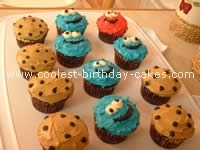 I baked cupcakes in Sesame Street liners. 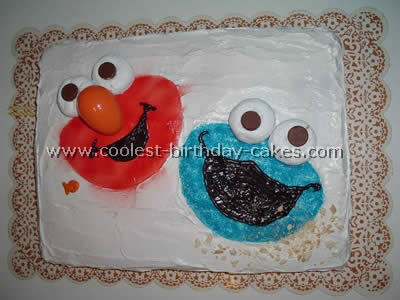 They were decorated with various icing colors to match Cookie Monster Oscar Bert & Ernie. The eyes were white plain M&M’s with dots of black icing. Cookie Monster is a fluffy light blue with black mouth. Bert is a smooth yellow with an orange peanut M&M nose and black icing for hair and eyebrow. Ernie is a smooth orange with a red peanut M&M nose red mouth with pink tongue and black hair. Oscar is a furry green with a brown eyebrow and black mouth with red tongue. Since I needed small amounts of different icing colors I used the ready-made cans and tubes available at the grocery store. A Bert and Ernie candle completed the theme. My son was thrilled! I made this cake for my son’s first birthday. He likes Sesame Street, balloons and loves splashing water so I thought of combining these three elements in a 3 tier butter cake covered with butter icing that I got from Wilton recipe book. Edible gel tinted with blue coloring for the water effect and desiccated coconut tinted with brown coloring for sand. 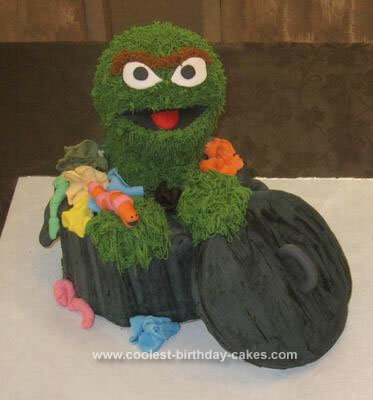 This Sesame Street cake was for my son’s 2nd birthday. He had an Elmo themed party. 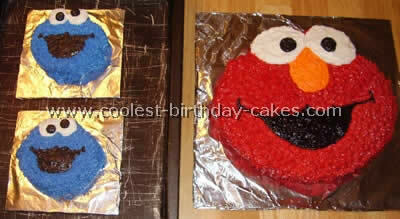 My inspiration for his cake came from his invitation, which had different color squares on it and Elmo popping out. I used a 10” and 8” pan for the cakes. I iced both cakes with an orange buttercream. I took purple yellow green and blue and made odd shaped squares all over the cake. They did not have to be exact as they are not on the invitations. On the top cake I made a big blue rectangle and I drew Elmo in it. I drew a banner that said Happy Birthday in Elmo’s hands. Around the bottom cake I made a red rosette border and around the top cake I made a red shell border. 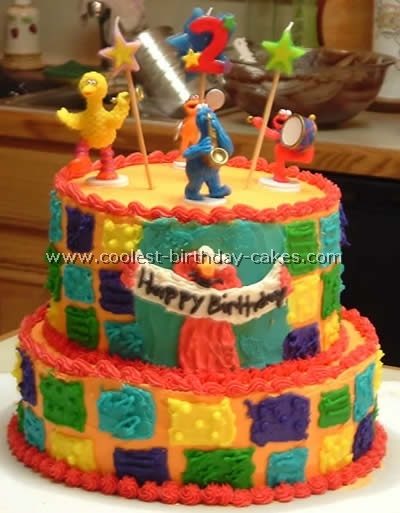 I bought the Sesame Street Figures from Party City and placed them on the top of the cake. I also made Sesame Street cupcakes. 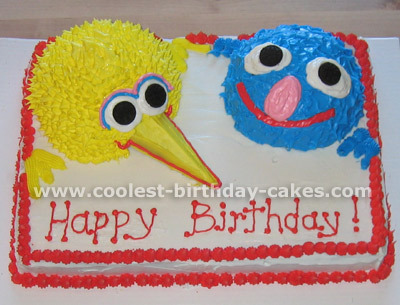 For this Sesame Street cake, I smoothed the eyes, mouth, and beak with a knife dipped in water. Very simple, although very time consuming! 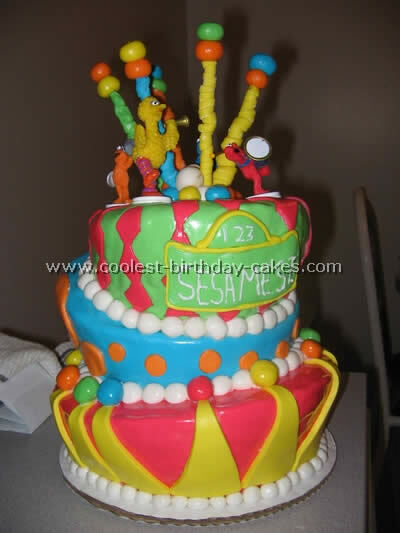 For this Sesame St. cake, I first baked a 12×18 sheet cake and frosted with butter cream icing. For the heads, I used Wilton ‘s Sports Ball pan (which comes in 2 pieces) and used one half for sesame street Big Bird and one half for sesame street Grover. Grover was decorated with butter cream icing and I piped on his eyes and nose with a round tip. His mouth was also piped on and his irises are mini Oreos. Big Bird was iced with a stiffer, royal icing using a leaf tip. The whites of his eyes were piped on with a round tip, and a smaller grass tip was used for the pink and blue outlining; mini Oreos were used for the irises, and his beak is a sugar cone. I cut out a bit of the cake to make it set level. 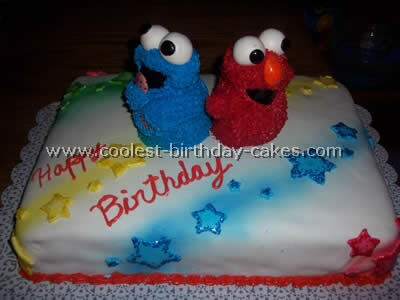 Lastly I piped on their hands with a star tip so it looks like they were peeking over the sesame street cake. 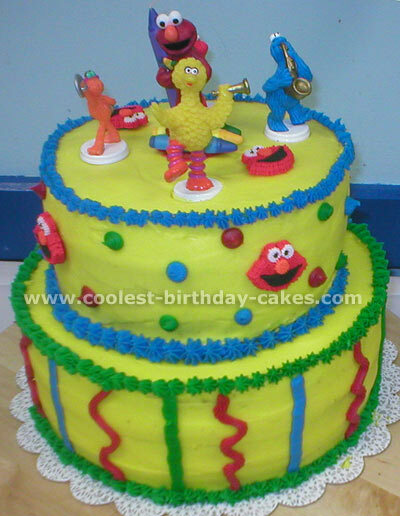 The bottom part of the Sesame St. cake is a 3 layer 10-inch round cake, the top part of the sesame street cake is a 3 layer 8-inch round cake. For this cake you must use at least 3 layers for the proper height, for added support I used 4 wooden dowels in the center of the 10-inch. This is a very heavy cake so use a sturdy cake platter. As far as the frosting for the cakes, I used lemon yellow, and decorated with bright red, royal blue and kelly green. This Sesame Street cake was made on a 1/2 sheet cake base with one half a Wilton sport ball pan set for each of the Sesame St. heads. 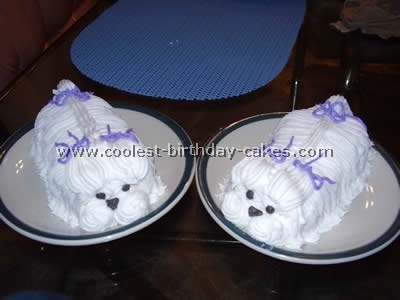 Once the cake was iced, the heads were placed in the corners & iced. Big Bird’s beak was done from a sugar cone. Using the grass tip Elmo’s head was covered in red "hair" & using a border tip Big Bird’s "feathers" were added. Very easy, but cute results! I did this one many times when I worked at the local Wal-Mart as a decorator. There we often needed to convert the basic flat cake to something more 3 dimensional, no shaped pans were available. My son enjoyed this one for his 1st birthday!